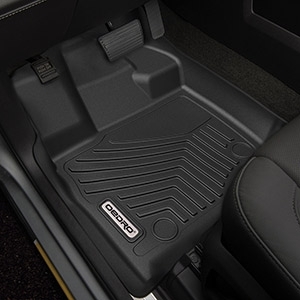 OEDRO's all-weather floor mats are laser measured to protect your Ford 150's foot-well and carpets. 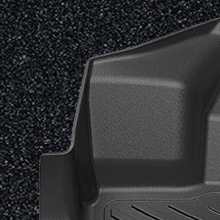 For ultimate strength and dependability, these floor liners feature high-density core materials and are engineered to safeguard your vehicle's interior. No skidding, no smell in bad weather. Notice: Super Crew Cab Only!!! All weather guard against Snow, Mud, Sand, Salt Water and More. 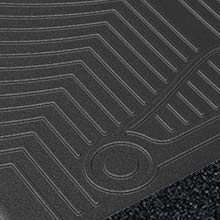 These floor liners are laser measured to protect the front, back and even up the sides of your vehicle's footwell. These floor liners offer protection against outside variables (such as mud, liquid and snow) and will prolong the life of your interior in all weather (Rainy, Foggy, Snowy day, etc). Featuring a deeply molded, chevron-shaped tread pattern, you are offered an efficient channel way to hold all dirt, water, snow and spills from hitting. It only takes approximately 15 minutes to install. And you shouldn't need any specialty tools. For reference these were installed on a 2015 Ford F-150 Super Crew. These are great mats that cover the exposed carpet extremely well. I was hesitant at first to purchase these mats having never heard of them before. I scoured YouTube looking for reviews, only finding a few. In those reviews the reviewer described the mats as thin plastic, and they sounded plastic, which concerned me even more. Being these mats are much cheaper then the two other big floor liner manufacturers, I took a chance. The liners arrived in a single box with the front liners wrapped in plastic ready to install. The rear seat liner was folded in half and required about 30 min in the sun to flatten out at the bend (it wasn't folded to a crease). Build wise these are every bit as good as the more expensive competitors out there. They have a nice rubbery touch feel that my feet don't slide around on and provides a sense of good cushioning to your feet. If I had to give a negative at all it would be the design at the sides. The channels in the liners channels any spilled liquids to the outside edge of the liner where the mat fits over the plastic edging. While this may work perfectly fine, I imagine the liquid hitting your door seals and running back towards the liner, possibly under. This complaint is nitpicking at its best. Over all the Maxliners are a great value, especially when compared to its higher priced competitors. The mats are amazing the quality it well worth the price. I’m amazed with the ease and how well they fit I am definitely recommending these to family and friends. Thanks for the fast shipping and packaging was in great condition. A++++ They make my truck loook real good and I’m not worried about cleaning mats off anymore. For the price you can't beat them! I bought these to fit my husbands 2016 F150 super crew cab, he is an outdoorsman so tracking mud and debris in a vehicle is a constant. These Fit like a glove! They go under the seats and have great coverage. They are a hard plastic which is fine. I feel they will be easy to take out and rinse off when need be. I will be buying some for my new car in the near future. Worth the money over weather tech and other name brands for half the price. This is my 1st time buying maxfloormat product. I have always went with weathertech or husky brand. I was really surprise how they fit my 2016 F150. They fit great and cover every inch front and back. They are well made just like other brands. I have no complains so far. Perfect fit and the holes on the mat help prevent it from sliding around. Great product! Perfect fit in my 2015 F150 supercrew. Fits better than Weathertech that I had in my 2010 F150 for less money. Q. What car model can Oedro floor mats be used in? A. 2013 - 2018 Dodge Ram 1500 Quad Cab, 2014 - 2018 Chevy Silverado Double Cab, 2014 - 2018 Jeep Wrangler JK 4 Door Unlimited, 2015 - 2018 Ford F150 Super Crew Cab. Q. Do these liners have a rubber texture or plastic texture? A. It is neither rubber texture nor plastic texture. It is new TPE/TPO material in between, not a soft rubber, but not real firm plastic. Q. Does this product contain Latex? A. No. 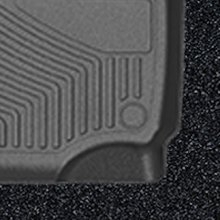 All floor mats and Household Mats are made from our advanced Thermoplastic Elastomer (TPE), which is virtually odorless, contains no harmful PVCs, cadmium, or lead and is 100% recyclable! Q. Is the material odorless? A. Yes, it is odorless, non-toxic, contains no latex, cadmium, lead or any harmful PVCs. Q. Does this include rear floor mats? The back mat is folded in half for shipping? A. Oedro sells both front only and whole set. Regarding whole set floor mats, the rear mat is folded in half for shipping. The TPE/TPO material is soft, and during the transportation process, it will be compressed and deformed. Therefore, when you receive the floor liners, please spread out, and the original shape will be automatically restored after a period of time. Q. Can I purchase only the driver’s side? A. No. The floor mats are only sold in front only or whole set. Q. Why isn’t the color the same as it appears online, or in the ad? A. On-screen or ad color representations may appear slightly different as a result of studio lighting, variance in monitor calibrations, or magazine print quality. Q. Can I put the floor mats on top of or under my factory mats? A. No. The removal of the factory mats is imperative for proper installation. 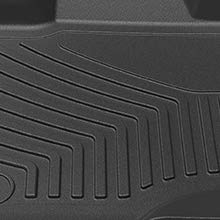 Failure to remove factory mats will result in an improper fit, which will likely create interference with vehicle controls, resulting in an unsafe condition for operating the vehicle. Q. How should I clean my floor mats? A. Our formulated floor mats are designed specifically for easy cleaning. However, mild detergent, warm water, and a soft-bristle brush will also help. Do not clean with harsh chemicals or apply silicone-based cleaners (such as Armor All). Q. Are Oedro floor mats stain-resistant? A. Yes! Floor mats will resist staining, however, routine maintenance is recommended to prolong the life and integrity of the product.